HAMDEN, Conn. - Cooler temperatures do not mark the end of the gardening season. garden in upstate New York. "People say, 'it's over,' and I say, 'no, no no,'" said author Margaret Roach, calling fall a rich and wise time. "It teaches us the most important garden lesson of all: nothing lasts." "I encourage you to be a part of your garden every day of the year," Roach said. When visiting garden nurseries, Roach said to look for plants that look good in early spring and fall to extend the life of the garden. "Go and buy things that look good in February, March and November. Don't shop the obvious route," she said. Roach, who has an extensive editorial background ranging from The New York Times, Newsday and Martha Stewart Omnimedia, lived in the city but purchased a home in upstate New York. "It was a long-distance romance," Roach said, referring to her weekend gardening. In 2007, she decided she had had enough of the hustle and bustle of the city and moved permanently into her "weekend home" of more than 20 years. During Roach's lecture, she provided examples of plants that do well in her garden. Her color palette concentrates on many red and gold-colored plants. "I always have a lot of yellow - maybe it's too much." (One of her favorites is the gold hinoki cypress.) Roach recommends utilizing "every category of plant you can to indulge your color palette," which can include ephemerals, plants with a long season of interest and late-show stars. "If someone tells you it doesn't go together, [that's] ridiculous. Tell them to look at a sunset or the plumage of a parrot," she said. "It's your place. It's your garden." 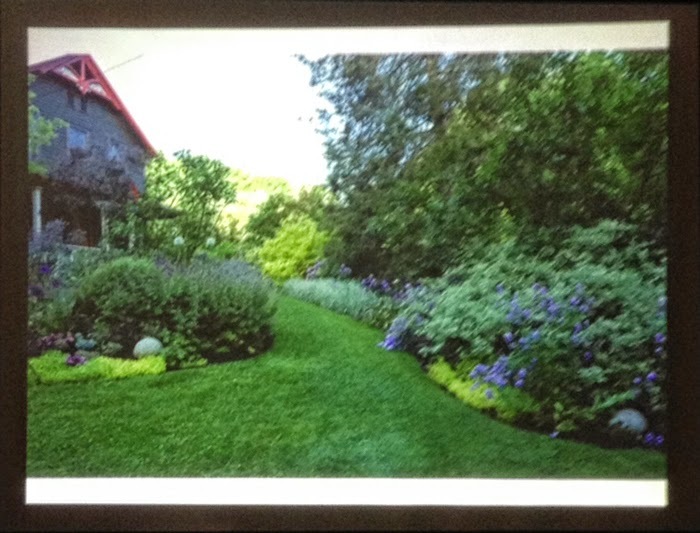 When it comes to garden design, Roach said most gardeners are not likely to step back and "see" the garden when they are outside, due to garden maintenance and other distractions. Roach advised gardeners to go inside their homes and look out the windows to "see where your garden belongs." "That's how I designed the whole garden: from the inside out," she said. She also recommended looking for "spectacular light opportunities" to showcase plants. Book cover from the publisher. "I feel like the garden is beautiful every day," said Roach. Even in the winter time, there are "incredible sensual shapes the snow makes." "We need to adjust the way we look, not just with our eyes, but with our heart as well," she said. "Look for more subtlety besides the show-stopper stuff." To Roach, gardening is not a hobby, but has a more spiritual nature. "We grow together, the garden and the gardener." A main part of being in balance with nature and the garden is not banishing wildlife from the garden. 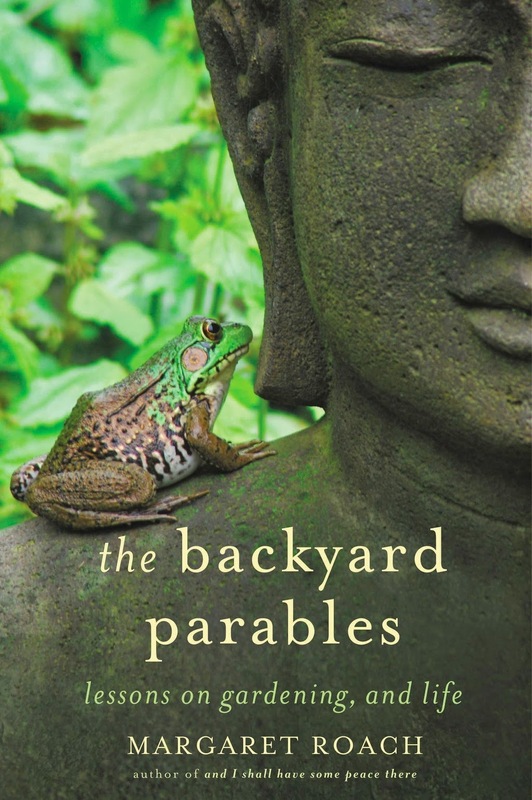 The cover of her third book (at left) is taken from a photograph in her garden of a tiny frog whispering into the ear of her Buddha statue. "If we are in too much of a hurry, this is what we miss," she said, describing moments in nature. She has counted 62 species of birds that visit her garden and attributes some of that success to providing water sources. "Water 365 days a year will change your garden," she said. If adding a pond to the garden is not feasible, Roach recommended the use of container water gardens, in which she uses large glazed ceramic pots with duckweed and fairy moss to shade the water. Welcoming wildlife to the garden also provides natural pest control. "People often ask me how to get rid of slugs. I tell them to 'get a frog or a snake.' People look at me like I'm crazy." Letting nature provide the checks and balances for pests also contributes to healthy soil for plants to grow in. "We - as gardeners - our primary job is to be stewards of the soil. If you are thinking of taking care of your soil ... don't kill it off with chemical fertilizers," she said. "Let's love our soil - let's love all invisible things. Suppress the urge to squish the caterpillar munching on your leaf." Margaret Roach will be participating in Open Gardens Days on Saturday, Sept. 20. For details, click here. Margaret Roach has been a true inspiration to me. I feel so much more connected to my garden through her wisdom. I don't have many mentors or idols but she is one of them. I hope to visit her and her garden one day soon. I agree with you! She has definitely influenced who I am as a gardener, too! I have not had an opportunity to visit her garden yet but I hope to in the future. Thanks for reading!